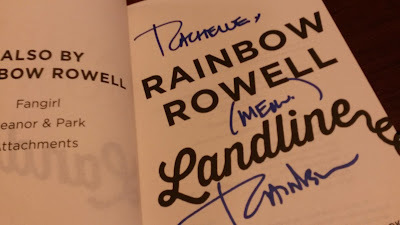 Yep, I went to the Rainbow Rowell signing in St. Louis last week. I can’t believe I got to meet Rainbow Rowell! She’s so quirky and amazing that I just want her to follow me around all my life and give me pep talks and tell me jokes. Plus, I could force her to give me info about Levi. Mwahaha. Oh! Before I forget, I also saw booktubers JessetheReader and Jessica (I think that’s her name?) from PriceisWong at the event. I didn’t say hi or anything, I just creepily saw them out of the corner of my eye. 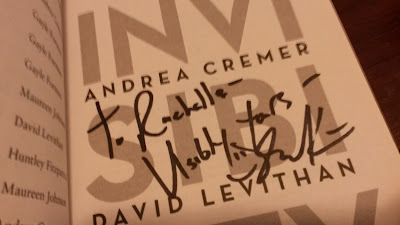 Anywho, I went to the signing last Tuesday and David Levithan was there as well. 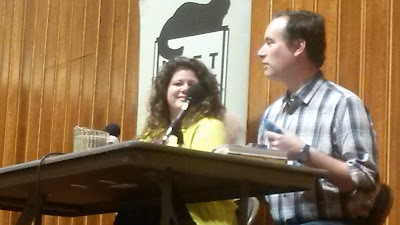 Thus, the signing started out with a discussion between the two of them. 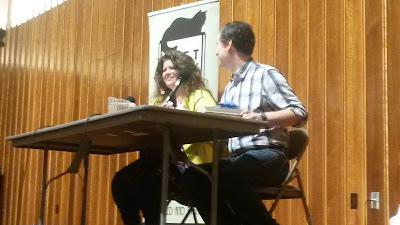 Rainbow joked about writing fanfiction of her fanfiction and how Simon Snow was a literary device to further the plot along in Fangirl, but somehow morphed into something more. 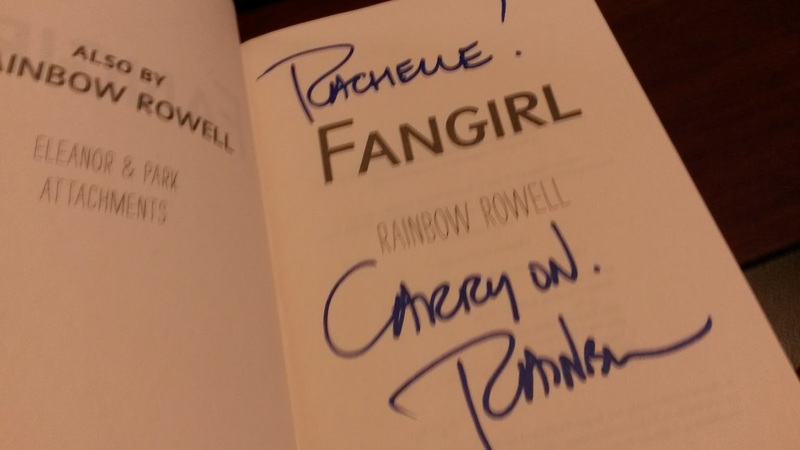 She also said that you don’t have to read Fangirl to read Carry On, just because you might get stuck on Cath’s thoughts about Simon Snow and Rainbow has actually changed things from Cath’s version of Carry On. After the discussion, Rainbow and David helped read excerpts from each of their books. Then, the Q&A happened. One of the questions had to do with their writing processes. David Levithan talked about being an editor. 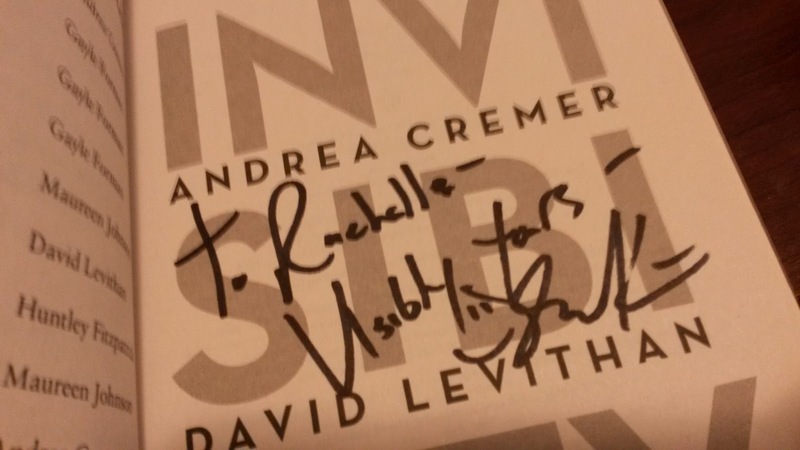 He actually edited some of Maggie Stiefvater’s books and even some of The Hunger Games. This lead to David making a joke about how if he had written The Hunger Games, it would be all about feelings and Gale and Peeta would be together, not Peeta and Katniss. 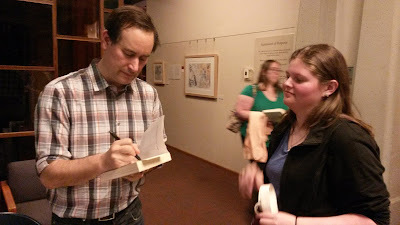 Additionally, David talked about his writing process and how he’s a seat-of-the-pants kind of writer, but he has a weird quirk—he reads the entire book out loud to himself after writing it. Rainbow Rowell on the other hand, writes a 1½ page outline and writes from the beginning of the story onward and, usually, she writes for about four to six hours in a row. 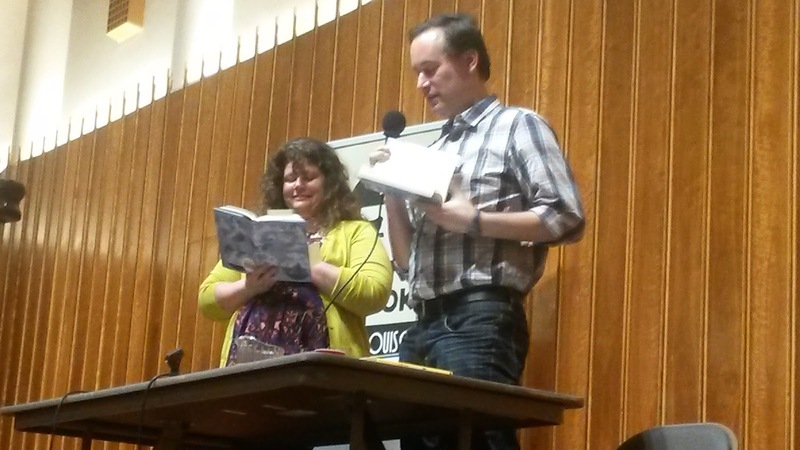 Another question was about whether or not David and Rainbow read books within the genre they’re trying to write in at the time. Rainbow said no because she might steal things and David said he can, that it doesn’t bother him to do so. But, they were also asked about whether or not they read fanfiction of their own works. Rainbow said no because she isn’t the intended audience for fanfiction of her books. It would be like J.K. Rowling reading Rainbow’s Harry Potter fanfiction. She said that would be embarrassing. 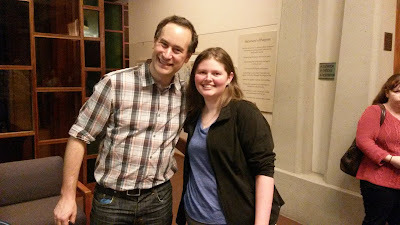 Once the Q&A portion was finished, we got in line for the signing. I was in Group 2 out of five or six, I can’t remember which, so I didn’t have to wait too terribly long, which is good because I had a long way to drive home. 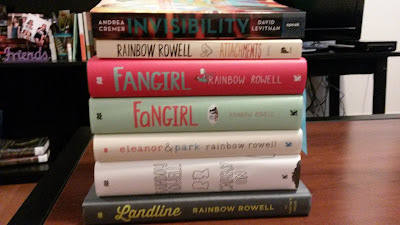 When I got in line, I realized just how many books I was getting signed and how heavy they were to tote around, especially considering the event coordinators wanted me to hold them all in my arms where they were visible instead of in my bag. I have no idea why since they didn’t count books or anything. When I finally got to Rainbow’s line, I told her all about how one of my professors is writing an article about fanfiction, using Fangirl as her source. 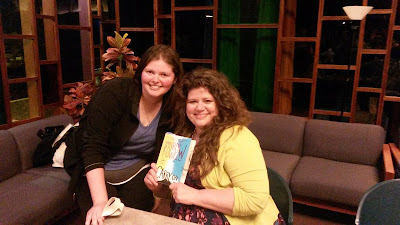 I also told her about how that same professor let me skip class, just so I could get her book signed at the event. Whoop! Whoop! Then Rainbow asked me if I had read Attachments, I said I had. 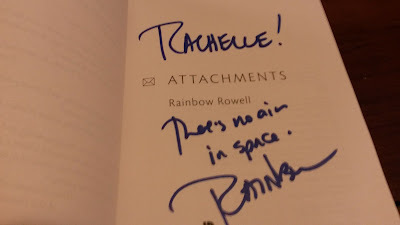 I guess not a lot of her fans have read that book yet. Oh, and she signed all of the books with different taglines. So cool. 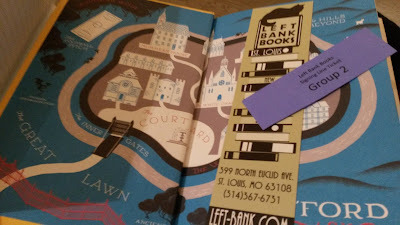 Normally authors just sign their name with a tagline only on the book they are currently promoting. After my books were signed, I hustled out of there because my parents were waiting (They drove me up there since my car is a POC.) and it was super late. All in all, I wished I had had more time with Rainbow. 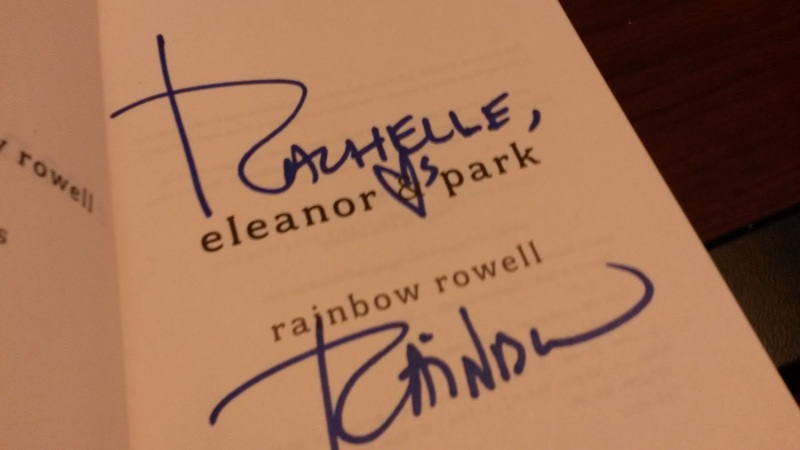 She’s the author of my favorite book, after the Harry Potter series of course, so I wanted to express my awkward and true love for how fantastic Fangirl is. Alas, there were just too many people there—I’m serious, there were at least 150 people—but I had a good time, nonetheless. I'm totally jealous! Two of my favorite authors! 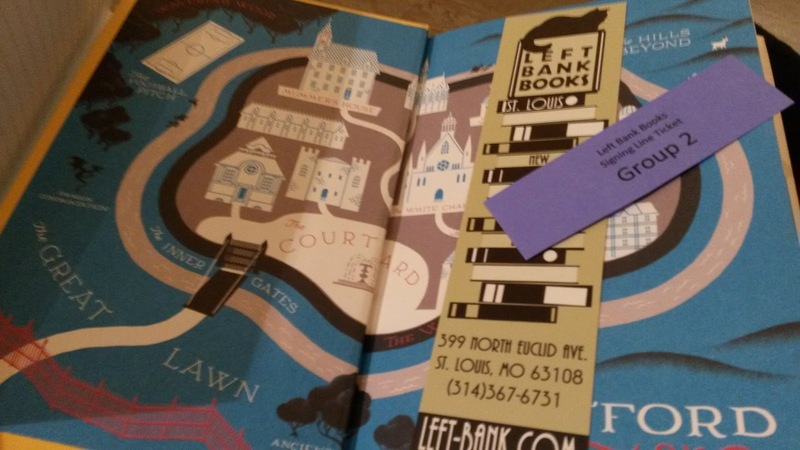 I was in St. Louis visiting my boyfriend at the end of September to mid-October. I knew about this signing and it was tempting just to stay for that...but unfortunately I couldn't stay longer. 150 people does sound like way too much, though. Hope you still had fun!